A little about Norms, as excerpted from their website. to satisfy their craving...Where Life Happens." Norms was pretty much what it promised to be--a 24/7 joint, and there was free parking in the back. Seating was counter or booth. The burger arrived in about 10 minutes after ordering. The Beef: 80/20, finely ground, completely tasteless, greasy Chuck. Seriously--not a hint of beef flavor. The Seasoning: Not even the tiniest bit of seasoning found its way into or onto the thick, bland patty. The Sear: The sear looked great...it was dark and even. Sadly, the beef was too bland for the sear to intensify much of anything. The Preparation: The thick patty was cooked on a large griddle--they got it to Med Rare competently. The Bun: A standard, seeded, hamburger bun, which was doused in Griddle Mate and toasted in a weak fashion. 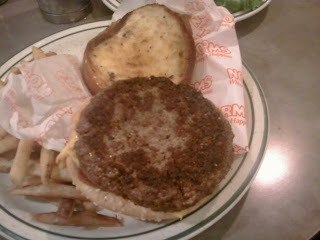 The result was a flabby, greasy bun with a weak texture that did not stand up to the burger. Meat to Bun Ratio: Skewed in favor of the meat--the bland, joyless meat. The Cheese: American Cheese. No issues there, but the poor cheese never stood a chance. The Fries: Meh--at least they were fresh. Norms was relatively cheap. The huge cheeseburger was about 9 bucks. 9 bucks worth of burger that could not be stomached--yech. 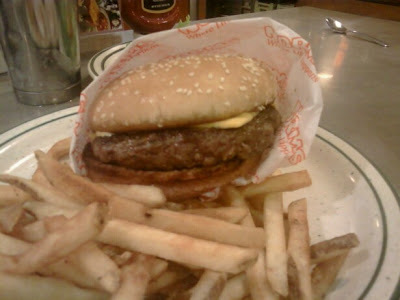 Burger Review : Norms...Where Bland Happens.